Kids of all levels of ability and fitness from 5 years old and upwards. From beginners to intermediates and advanced. Matt Grainger, head coach of Manly Surf School, has been working on school holiday programs from 1983, since he was 13 years old. 25 years later he is still doing it and loving every minute of it. Seeing a young kid stand on a board for the first time is a buzz for the instructor as well as the student. Matt and his team of instructors run 4 day courses for kids every school holidays, even in winter. All kids are provided with the right surfboard, wetsuit and placed in the right age group to get them having the most fun and learning quicker. – Those that have never surfed before. – Those kids that have had a few surfing lessons, attended some term and school holiday programs but are still learning. – Those kids/ teens that are catching broken waves on their softboard but have yet to progress to a fibreglass board. Manly Surf School Instructors will split the groups according to ability to ensure we have our brand new surfers in one group, and the slightly more experienced group with another. Instructors are in the water during these lessons and assist with pushing participants onto the waves. Generally, the Learn to Surf groups are split into age groups from 5 years to 8 years, 8 years to 11 years, 11 years to 14 years and 14 years to 17 years. 17 years and over surf in the adult classes. Friends and siblings aren’t split up if they don’t want to be. Moving from a softboard to a fibreglass board is a big step, and can be quite challenging. So it’s always good to get some advice prior to taking that step. Your Manly Surf School Instructor will be able to let you know if your child/ teen needs to advance to the next level, if they should be trying out a fibreglass board and even assist with advice on which boards to purchase to progress further. All equipment of softboards, rash vests and wetsuits are provided. Please bring your costume, towel and change of clothes. We have our new Intermediate lessons also available for those kids progressing from beginner to intermediate level or from a softboard to a fibreglass board. 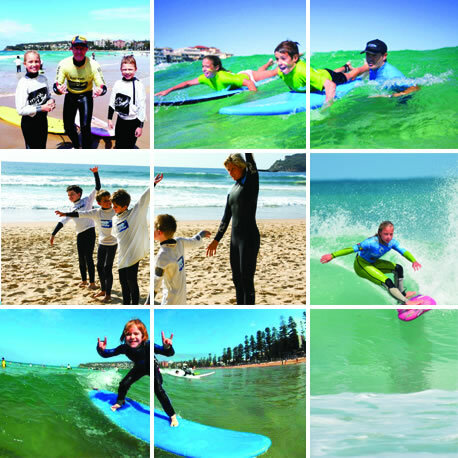 – Those kids/ teens that are catching green waves (unbroken waves) out the back on a softboard. – Those kids that have progressed onto a fibreglass shortboard but still need assistance catching waves. Our Instructors will be in the water during these lessons to assist by pushing kids onto the waves and helping out with wave selection. It is a big step moving from softboard to a fibreglass shortboard and our instructors will be there to give their guidance and advice. Please bring your fibreglass boards along to this lesson, costume, towel and a change of clothes. We can provide the softboards if needed and wetsuits. HPSC classes run out of Long Reef & Manly and have both a beach session and gym & skate sessions at our HPSC on offer. – Those kids/ teens that that have been surfing on a fibreglass board for some time. – Those kids/ teens that are independent in the water and require no assistance to catch a wave on a fibreglass board. – Those kids/ teens that are starting to do manoeuvres like turns, etc. Our instructors are not in the water during these programs. Their role during these programs is to watch, film and critique each move. They do this, by filming and photographing each participant from the beach and then going through the footage at the end of the lesson to provide feedback. – Those kids/ teens that want to improve their strength, fitness and skating for surfing. – Gym sessions are focussed on core strength, balance and overall fitness for surfing. – Practice aerial manoeuvres, turns and more on the skate ramp. – All of our personal trainers are surfers themselves. Please wear comfortable shoes and clothes. Boards, helmets and guards/ pads can be provided or you can bring your own. Please bring some water. During the School holiday programs there are all day options of Surf, Gym and skate. Please bring lunch along to these all day programs. For those surfers competing in events. "Please note, it is advisable to book during low tide lessons wherever possible for kids, particularly those younger aged kids wishing to take part in our Learn to Surf and Intermediate programs.